Join us a for an exotic musical evening. 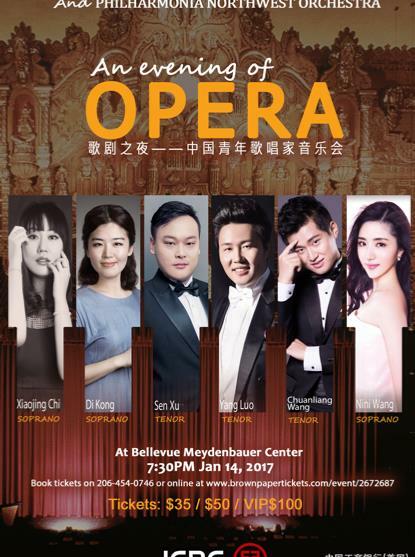 “The Night of Opera”, Chinese youth singer concert tour, is sponsored by Industrial and Commercial Bank of China (US), and jointly held by Seattle Easter Performing Arts Group and Seattle Western Symphony Orchestra. Seattle Easter Performing Arts Company aims at promoting strengthening cultural communication among international youth singers, and introducing outstanding singers' works to audience oversea. Every year, the company cooperates with Chinese professional theaters, performing arts companies, and music academies, regularly holding various types of Chinese or western concerts. Seattle Eastern Beauty Choir is a subsidiary group of the company.